Prior to any discussion on what to do about Venezuela, a consensus about what led to this crisis needs to be reached. The role of Iran is critical in such a conversation. As in the Syria conflict, Iran's primary role is preparing the Venezuelan battlefield through a range of operations in irregular warfare, using non-state actors and surrogates to gain influence over the population. Strong evidence suggest that Venezuela used its immigration agency to provide Venezuelan identities and documents to several hundred, if not thousands, of Middle Easterners. Without proper vetting and verification measures in place, and a high degree of counterintelligence support, our regional allies will not know if Venezuelan refugees spilling across borders are legitimate refugees or members of a transregional clandestine network between Latin America and the Middle East. Any intervention in Venezuela -- military, humanitarian or otherwise -- will not work unless it is aimed at removing the external influences, especially Iran, Russia and China, that have turned Venezuela into the Syria of the Western Hemisphere. U.S. Secretary of State Rex Tillerson just completed, by most accounts, a successful visit to Latin America. He began his five-nation tour by invoking the Monroe Doctrine and suggesting the Venezuelan military could manage a "peaceful transition" from the authoritarian leader Nicolás Maduro. This reminded several regional observers of President Trump's suggestion last year of a possible "military option" for Venezuela, hinting at possible U.S. or multilateral intervention to stop the country's collapse. An armed action or military intervention in Venezuela by any nation in the Western Hemisphere, including Venezuela's own military, must take into account the role of Iran, Russia and China in the crisis. Russia and China were prominently mentioned by Tillerson during his visit to the region; Iran, however, was notably absent from his remarks. Most regional analysts will likely agree that Venezuela has become a Cuban-occupied country. With more than 30,000 Cubans embedded in Venezuela, many of whom are part of the intelligence and security apparatus, it's clear that the Castro brothers had an integral role in the country's collapse. The Cuba narrative, however, misses two key points. First, it fails to identify precisely Cuba's role in Venezuela, and secondly, it ignores the presence and influence of other key extra-regional actors. Of these, Russia and China are perhaps the two most visible. As in Syria, and historically in Central America, Russia is the primary supplier of lethal military aid, along with financial and technical support to the Venezuelan armed forces. Totaling more than $11 billion in military goods thanks to Russian arms sales, Venezuela represents 75% of Russia's total foreign military sales in the region. Additionally, the Russian state-owned energy firm, Rosneft, has provided Venezuela with an estimated $17 billion in financing since 2006. Moscow has leveraged its collateral deals to acquire expanded stakes in Venezuela's oilfields, namely the heavy-crude Orinoco belt, which gives Russia more control of Venezuela's strategic energy assets. Russia is not alone in leveraging debt for greater control of strategic assets in Venezuela. According to the International Institute of Finance, China holds more than $23 billion in Venezuela's foreign debt, making it the country's largest creditor. Through these credits and loans, Beijing is the primary benefactor and principal banker to the South American nation, and China has enormous leverage over outcomes in Venezuela. Chinese energy companies are also gaining an increasing share of Venezuela's most lucrative oil field, the Faja Del Orinoco (FDO). With a 25-year land grant to the FDO, China has secured access to strategic territory in Venezuela; and in exchange, China has used its checkbook to fund many of the Bolivarian Republic's social programs, such as subsidized housing and free medical clinics. External support from China, Russia, and Cuba has contributed significantly to propping up the Venezuelan government during the last decade. Both Russia and China continue to leverage their financial, military, and energy support to the Maduro regime through Cuba's robust counterintelligence and human intelligence networks, which permeate Venezuela's highest political and military levels. Cuba is indispensable to China and Russia for its operational knowledge of Russian-supplied equipment, along with its longstanding ties to communist clandestine networks. In this context, it is hard to imagine a scenario that removes Havana's presence from Venezuela without first passing through Moscow or Beijing. Iran, on the other hand, can operate independently in Venezuela because it taps into a separate, more robust clandestine network that has been developing in Latin America for more than half a century. Approximately 60% of the population of the city of As-Suwayda in southwestern Syria (pop. 139,000, according to the 2004 census) are Venezuelan-born dual citizens. Many more have arrived since 2009. The district of As-Suwayda (same name as the city) has been dubbed "Little Venezuela." Estimates indicate that upwards of 300,000 Syrians from the As-Suwayda Governorate currently live halfway around the world in Venezuela. According to the late Venezuelan President Hugo Chávez, more than a million Syrians reside there. 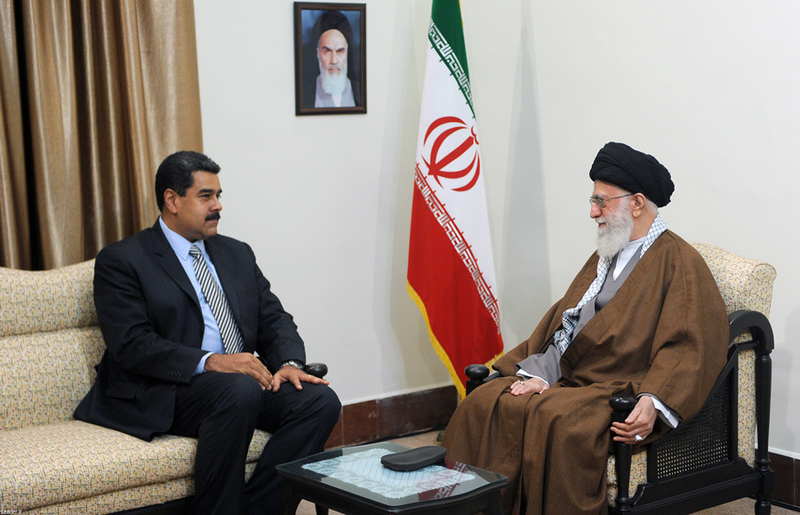 This Syria-Venezuela connection could represent a clandestine network managed by Iran and critical to the advancement of Chavez's "Bolivarian revolution." As in the Syria conflict, Iran's primarily role is preparing the Venezuelan battlefield through a range of operations in irregular warfare, using non-state actors and surrogates to gain influence over the population. Its influence is often not visible on the ground, but is felt through the repression anti-regime of protestors in 2017 and earlier. During anti-Maduro demonstrations, the motorcycle-riding members of the Venezuelan civilian militias known as Collectivos were remarkable for being modeled and trained by Iran's paramilitary Basij militia. The role of the Basij in crushing Iran's Green Revolution in 2009 provided lesson for dealing with anti-regime protestors half a decade later in Venezuela. The extent of Iran's influence in Venezuela has long been a source of debate for the U.S. and regional security analysts. The Iranian regime's roots as a revolutionary movement with anti-imperialist rhetoric and expanding dominance throughout the Middle East has brought Russia and China, two historic cold war adversaries, closer together. In many ways, Iran has positioned itself in Venezuela to capitalize on China's economic clout and Russia's military footprint. For instance, Iran's Ministry of Defense and Armed Forces Logistics (MODAFL) used a variety of joint projects with Venezuela's military industry (CAVIM) as well as Russian and Chinese oil contracts with PDVSA to shield its evasion of international sanctions. Iran's comparative advantage, however, is in the development of clandestine structures through surrogate forces and proxy networks. Its most prominent proxy force, Lebanese Hezbollah, is known to deploy to global hotspots on behalf of Iran. Meanwhile, the Qods Force (the extra-territorial arm of Iran's Islamic Revolutionary Guards Corps - IRGC) works with Hezbollah to increase social pressure in these hotspots to exacerbate conflicts. The Hezbollah and IRGC-QF cooperation is an important component of the Syrian civil war. In Venezuela, long-standing clandestine networks from Syria, Lebanon and the Middle East are playing a similar role behind the scenes in shaping the narrative and ultimately directing the actions of the country's key players. These networks have provided the Venezuelan regime with the know-how systematically to control the population and dominate the narrative. Their rise to prominence can be seen not only in the abundance of Arabs in the Venezuelan government, but also in the way the Venezuelan crisis has unfolded, following the same pattern of economic and social grievances to violent uprisings with external support. The humanitarian crisis in Venezuela began with severe shortages of food and medicine prompting a legitimate grievance among the population, which lead to an uprising last year. Many forget that prior to the its civil war, Syria faced a severe drought that was a factor in other violent uprisings that began in 2011. As in Syria, Venezuela has become a humanitarian crisis that exacerbates refugee outflows with serious counterterrorism concerns and a strong Russian and Iranian presence. Unlike Syria, however, this crisis rests much closer to U.S. shores. Strong evidence suggests that Venezuela used its immigration agency (SAIME) to provide Venezuelan identities and documents to several hundred, if not thousands, of Middle Easterners. Without proper vetting and verification measures in place, and a high degree of counterintelligence support, our regional allies will not know if Venezuelan refugees spilling across borders are legitimate refugees or members of a transregional clandestine network between Latin America and the Middle East. As Secretary Tillerson calls upon regional allies to increase support to resolve Venezuela's humanitarian crisis and apply more pressure to the Maduro regime, it would make sense for the Trump administration also to help U.S. allies by enhancing their counterintelligence and counterterrorism capabilities against Iran and Hezbollah in the Western Hemisphere. It appears that some of this cooperation is already beginning to take place, as evidenced by a new agreement between the U.S. and Argentina to tackle Hezbollah's illicit financing in the Southern Cone. Dealing with the tragedy that has transpired in Venezuela over more than two decades will require a better public understanding of the central role of extra-regional actors, particularly Iran, in the country's crisis. Related Topics: China, Iran, Russia, Venezuela receive the latest by email: subscribe to the free gatestone institute mailing list. If you put a communist government in charge of the Sahara desert, in 6 months you will have a shortage of sand. Venezuela is the largest Iranian outpost in South America. Obviously, the Obama Administration passively colluded with the communist and socialist regimes to set up another "Cuba" to infiltrate the Western Hemisphere. The news media has been silent and this is the first report of the extent of the invasion Obama allowed. Good. Let them deal with that dysfunctional and failed state. Venezuela, once a wealthy, stable country thanks to its oil revenue, has been reduced to impecunious, riot-torn poverty, near or greater than Zimbabwe's. China apparently is helping Zimbabwe weather its destitution. And now China and Iran are helping Venezuela over the hump of complete collapse. Iran is intervening in order to spread more Islamic chaos in South America. Fake Venezuelans can be sent to Central America to make their way to Mexico and the U.S. border to infiltrate the U.S. is our State Department doing anything about it? Or is its Deep Staters want Venezuelan socialism and another stream of jihadis implanting themselves in our country? This article contains no explanation of WHY Iran, Russia, China and Cuba are so involved with Venezuela. Admittedly, these four countries are similar, in that they want to diminish the United States in its military and economic presence in all parts of the world, but why destroy Venezuela in order to do this? Surely there are easier ways, not involving cross-continent movement of populations and assets. WOW !!! This is an eye-opener. The world is dramatically changing while the west is kept in the dark. "Prior to any discussion on what to do about Venezuela,....."
Just a minute. Just WHO should HAVE TO DO ANYTHING "about Venezuela? US? We've showered billions of OUR dollars on OTHER countries that are destitute, mostly due to the communistic dictatorial "leaders" who rob and pillage the populace. "WE" need to keep our noses out of it, and "let the chips fall where they may!"